Next week on Thursday, Aug. 25, the United States Mint and the National Park Service will formally introduce the 34th release in the series of America the Beautiful Quarters. This one commemorates Theodore Roosevelt National Park in North Dakota. This year’s fourth quarter ceremony takes place at the park’s visitor center. It coincides with the 100th anniversary of the founding of the National Park Service, which has had stewardship of America’s national parks since August 25, 1916. A coin forum will occur the evening before the quarter launch and a coin exchange will take place right after the ceremony. All three events are open to the public and free. 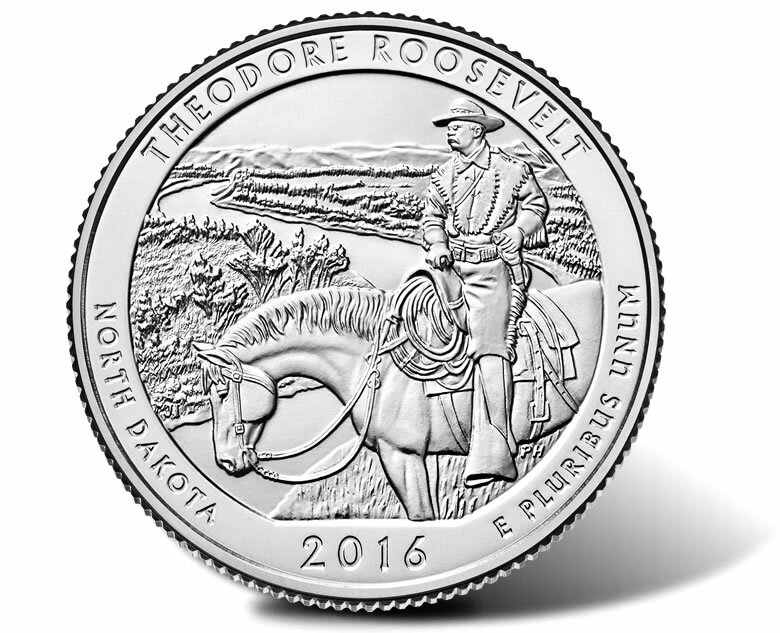 Theodore Roosevelt National Park quarters also enter circulation this month but it can take a while before they’ll appear in commerce, since Federal Reserve Banks distribute coins to financial institutions without regard to their design. The launch event allows everyone at the ceremony an early opportunity to get the fourth of five 2016-dated quarters. The following map shows the location of park’s visitor center. The coin exchange is at the same venue as the ceremony. First State Bank of Golva will sponsor the event. Attendees can swap cash for $10 rolls of the new quarters, and usually there is a $100 limit per person. As mentioned earlier, the coin forum is scheduled the day before the ceremony. This forum gives people an opportunity to learn more about the United States Mint and ask questions about its products. The forum can last about an hour. The following map shows the location of the theater. Starting at noon ET on Monday, Aug. 29, the United States Mint will also sell Theodore Roosevelt quarters direct to the public in roll and bag options. Specifically, the U.S. Mint will offer them in 40-coin rolls, 2-roll sets, 3-roll sets and 100-coin bags, at prices that range from $18.95 to $34.95. Consumers can get the new quarters online at catalog.usmint.gov once they go on sale. These product releases will be covered here on CoinNews. The U.S. Mint’s program of America the Beautiful Quarters kicked off in 2010 and will last until 2021. Five unique designs will appear every year — each depicting a national park or other site. The first 2016-dated release commemorates Shawnee National Forest in Illinois, the second honors Kentucky’s Cumberland Gap National Historical Park, and the third celebrates Harpers Ferry National Historical Park in West Virginia. The final 2016 quarter features Fort Moultrie (Fort Sumter National Monument) in South Carolina. Thank you, Rhonda, for the info. Can’t wait for the TR 5-oz silver coin – very nice design! Is mint and collectors ready for 225 years of US mint ? i think that will be biggest event in modern coin collecting history! Are u prepare ( save money) for 2017 ? If I remember correctly AP’s can start buying the 5 oz coins next Monday.